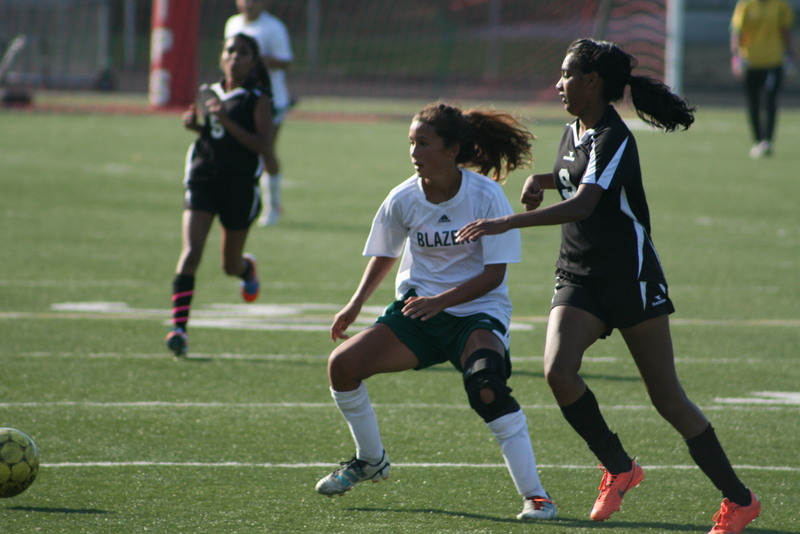 Timberline High School frehsmen Leah McGee (#2) is one of several under-classman playing a big role on the Blazers team this year. After a short acclimation period, McGee has adjusted and believes Timberline is primed for a big season. Success will in turn breed expectations, and the Timberline High School girls’ soccer team is learning that at the beginning of their 2012 campaign. After making the 3A state playoffs in 2011 with a collection of both experienced and young players, the Blazers are ready to make a repeat trip to state, and maybe beyond. 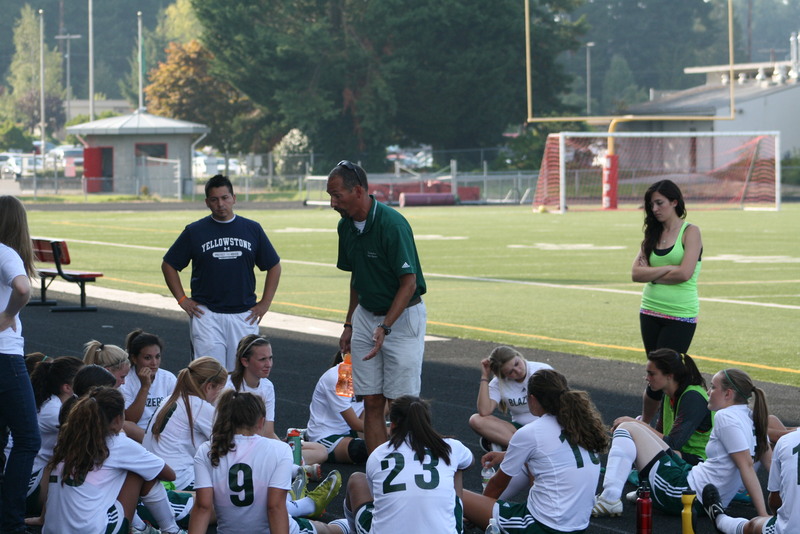 Timberline girls soccer coach Jeff Peliter provides his team with some words of encouragement during halftime of the Blazers match against rival North Thurston on Thursday, Sept. 13, at South Sound Stadium in Lacey. Peltier says his team is on the right track for a return trip to the 3A state tournament. Led by Coach Jeff Peltier, a Timberline High School graduate, the Blazers will rely on a host of young, but now experienced players, to fill the void left by five seniors last year. It is a task Peltier expects his team to meet head on. Losing to 3A power Seattle Prep 3-0 in the opening round of the tournament was discouraging to the Blazer’s, but they’re confident in this year’s lineup and the possibility of journeying further in postseason play. However, Gubser knows it’s early in the season, and that the team has a long way to go before accomplishing their goals. “I think we need to step up our game and really concentrate on each other and working together,’’ Gubser said. Peltier credits the upperclassman, both on this year’s team, and from year’s past, for helping lay the foundation Timberline has seen recently. “Of course the juniors and seniors deserve some credit. We’ve been building this up year after year, and we’re finally getting to the point where we just expect that we’re going to be able to pull things out and do a good job,” he said. A slew of underclassman (including freshmen) has had to fill in key positions for the Blazers, a task no easy for a player joining an experienced and talented team. 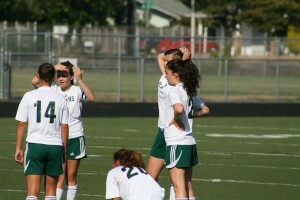 With a collection of new and young talent, combined with state tournament experienced players, the Timberline High School girl's soccer team has high expectations for the 2012 season. Despite having less than a month of experience with the team, McGee is confident in the Blazers ability going forward, and is thankful she has a coach who supports her and the rest of the team. “It’s really encouraging actually to hear him cheering you on,” she said of Peltier. 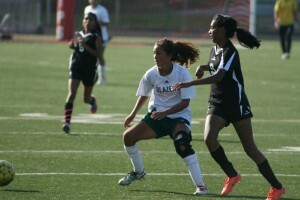 Like all talented teams, the Blazers will not be satisfied until they have a strong showing in post-season play. For more information on Timberline High School, click here. Play-by-play high school football action can be heard on KGY AM 1240.